318 pages | 45 B/W Illus. The collection focuses on the intersection of global biodiversity policy and the promise of deliberative democracy. In doing so, it examines how new discursive logics emerge in global citizen deliberation that might destabilize the impasses encountered in biodiversity negotiations, how a "global citizens’ voice" emerges in deliberative processes despite the dominance of national institutions in the lives of those citizens, the most effective and innovative ways to amplify the results of large-scale deliberations to policy makers and broader audiences, and how future citizen deliberations can be designed to make them fair, feasible and consequential processes, in general and for biodiversity issues in particular. 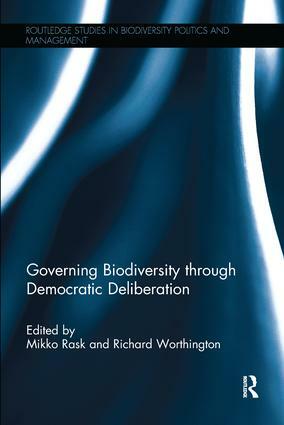 This highly original contribution to the field provides theoretical discussions, empirical analyses and local experiences of biodiversity policy, making it an invaluable resource for students and scholars of environmental politics, governance and sociology, particularly those interested in deliberative democracy, citizen participation and biodiversity.